I’ve been distracted for a few days, first by the ASSA conference in Chicago – of which more in the next post – and then by my eldest son’s wedding. 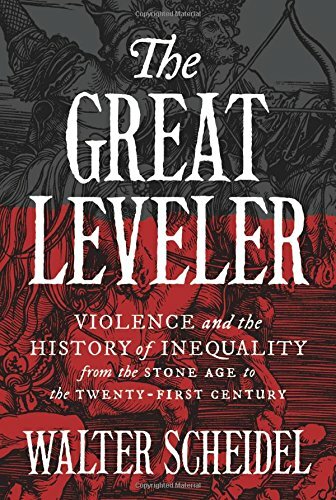 But I’m now eager to read a book that has just arrived at Enlightenment Towers, Walter Scheidel’s The Great Leveler: violence and the history of inequality from the Stone Age to the twenty-first century. 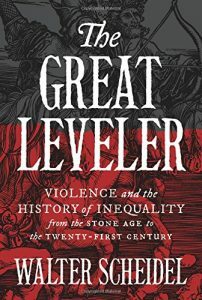 “Are mass violence and catastrophes the only forces that can seriously decrease economic inequality?” the inside cover blurb starts. The following 450 pages answer: yes. I’m not expecting it to be a cheerful read. By coincidence, there’s a recent VoxEU column supporting the Great Leveler hypothesis. Looking at Europe’s rich since 1300, Guido Alfani concludes that only the Black Death and world wars have significantly reversed increasing inequality. All this new work follows Thomas Piketty’s raising the question in his tome Capital in the 21st Century. Talk about an unpalatable trade-off. This entry was posted in Main Page and tagged inequality by Diane Coyle. Bookmark the permalink. This will only become more acute as robots and AIs help those who own capital “do well”. The Dem Party support for ever increasing levels of envy against the rich, combined with a superstitious belief in the effectiveness of gov’t programs to help makes it more likely that countries follow Venezuela down, rather than Chile up. Equality of poverty is not a good equality. What most elitist economists are unwilling to discuss is using gov’t to directly help poor people “do the right thing”. It’s fairly well known in the US: a) avoid having children before marriage, b) get a High School education, and c) keep constantly working at a job for at least one year. Finding effective ways to help/ encourage poor folk to change their behavior, and thus not be so poor because they are working (rather than getting gifts), is the most important economic job that is not being done. It probably could be better done outside of gov’t — but it’s better for the gov’t to do it rather than nobody. Universal Basic Job — with a National Service that accepts everybody, with deep personalized service of each individual to actually place them in the most reasonable positions available. Often this will mean health care, construction, child care, and education. Progressive wealth taxes, not income taxes, should also be considered, on those whose wealth is over 100 * the median annual income. In the US, that’s ~$50k/yr, so for those whose wealth is more than $5 million, there should be some small annual one tenth of 1% (0.1%) on the amount over, to be paid in 4 parts yearly. This wealth would be real estate and financial assets (stocks & bonds). This should double to 0.2% at $50 million, 0.4% at $500 million, 0.8% at $1 bln, and 1.6% for that over $10 bln.